The value of peer code review is undeniable. But despite this, it continues to be a much-maligned milestone in the software development cycle. Code reviews are difficult to implement consistently, the review is often left incomplete, and let’s be honest, developers generally don’t like doing them. This white paper provides specific recommendations on how organizations can implement a simple, effective code review process that takes advantage of the latest tools and technologies. 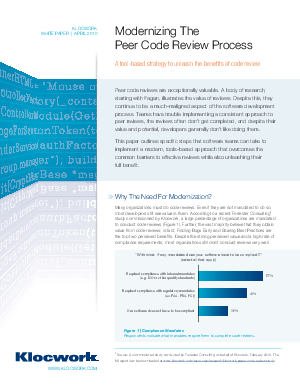 Download the whitepaper now and learn how a tools-based approach can unleash the full potential of code review.